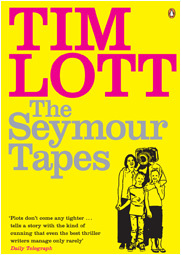 A more experimental approach to the novel, being told as it is entirely through the eyes of various CCTV cameras and the narrator, a writer called ‘Tim Lott’. The closest I’ve ever got to post modernism, and a trick I found hard to pull off. In the end, though, I thought it worked well, albeit rather too like a ‘genre’ novel to gain much literary reputation. All the same, it was bid for by a large number of TV and film companies, and with any luck, an adaptation will appear on Channel Four in 1997.